The single life can be tough for anyone, but especially for seniors. Finding singles over 60 to live out your golden years with is a process that can take some time. Introducing someone new into your already established family can be challenging, especially if you have children and grandchildren in the mix. One of the easiest and convenient ways for seniors to get back out in the dating game without feeling the urgency of finding the ‘one’ is to try SeniorMatch.com, an over 60 dating site. 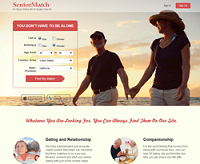 SeniorMatch.com is a senior dating website to connect with others in their age group. If you are searching for friends or even looking for a more serious relationship, you will benefit from this website. With over 10,000 active members there is a lively community to connect with. When you first sign up you are offered a limited free trial, which will allow you create your own profile, send and even receive emails, however, the emails must first be sent by a paying member. If you enjoy the service, you can sign up for the monthly membership which costs $15.95/ month if you sign up for the 6-month membership. If you are only looking to give it a try for one month, the monthly fee is $29.95/ month. Sign up for free, set a lifelong profile. Add no more than 26 pictures. If you want to learn more about someone you are interested in before starting a conversation with them, you can simply check out their member blog. This allows you to get an understanding of who they are by reading through their posts. The search results from layout members within an appropriate distance for you to make it easier to find someone close to connect with. The members who belong to the site are serious about finding true connections, allowing you to find someone that really wants to get to know you. Before a member’s profile is visible to others, it is first reviewed by staff members, making it easy to find trustworthy individuals who are looking for connections. When you are in the free trial phase, you are not able to view the last logged on information about members. This feature is only visible to paying members. After you create a profile on SeniorMatch, you become a standard member. Then you can add up to 26 photos, search for people by quick search / by username, add first date idea and send free winks! You can reply messages / online chat sent to you by Gold Members! If you want to use all the features without any limitation, you can upgrade to be a gold member. SeniorMatch currently accepts payments via: Credit Card / Charge Card / Check Card / Debit Card; Paypay; Bank Check / Money Order by postal mail. Can I use SeniorMatch on mobile phone? Yes, you can visit our mobile site, or download our APP. How to contact SeniorMatch’s customer service? With all the amazing features, I’d say this over 60 dating site has everything you are looking for. The paid membership is definitely worth signing up for 6-months to give it a try and find those you can connect with instantly.